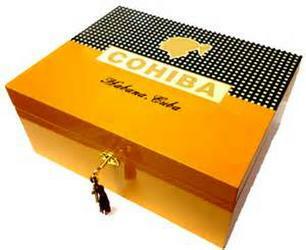 Stylish and solid humidor with a high gloss orange exterior carrying the Cohiba logo and with a Spanish cedar wood lined interior. This humidor has an internally lid mounted hygrometer and humidifier, moveable cedar wood partition and a scratch resistant felt lined base. It will help you to ensure your cigars are kept at a constant humidity, to keep them in good condition, extending their life, with the cedar adding to their flavour.